Part of the price of visiting my blog involves cutting me some slack--humoring me--regarding my four grandchildren, Gracie, Wyatt, Owen and Henry. Hey, it's my blog. Deal with it! This video involves Wyatt in the love of his young, 10-year-old life: sports. 1-is waiting for the Clinic to perform his Department of Transportation (DOT) physical for a truck driving job. We will provide you with salary as soon as he is processed. 4 more placements are need by the end of July to meet OAI requirements for funding for 2013-2014. We are very optimistic that in the next 30 days the other 4 will be employed. Somewhere I read about two neighbors. Both grew up in a community of opportunity. One neighbor lived a cautious, responsible life. He worked hard, saved his money and made his family proud--a real dependable guy. The other, younger man lived in a more carefree manner. It wasn't that he resisted work, he just had a different vision for his life--a real restless guy. At one point, the younger man left the neighborhood of his family. He cashed in his inheritance card with his father and set off to make his way in life. Things didn't turn out so well for him. He didn't use his resources wisely. He romped and played hard for a while, but he allowed his initial freedom to sour his heart. He knew, firsthand, desperation, hunger, homelessness, hopelessness, exploitation and oppression. He violated all of the principles of his upbringing--he really left home. When at the very end of his rope, he "came to himself." He recalled his community, his neighbors, his family. He went back home with a speech all ready to deliver. "Please give me a job doing whatever is needed." He threw himself on the mercy of his lost, but beloved community. They welcomed him home, threw him a party and supported his quest for reestablishing himself in a respectable life. The community lived out of its strength to lean into the weakness and need of a fellow community member. However, not everyone was pleased. The man's older neighbor threw a fit, organized a public policy response and opposed the younger man's attempts to get reestablished. He urged the community not to assist the lazy, no good man who left and was now back expecting the community to help him out of a crisis for which he was responsible. Finally, the white-haired mayor of the community confronted the older neighbor, "You don't seem to remember what sort of community we have here, a community we've worked hard to establish on principles of honesty, fairness, compassion and hope," the old mayor explained. "We've all been in tough scrapes at one time or another. We've depended on each other for support, second chances and the hope that comes from loyalty, understanding and high expectations. Just remember, your opposition to your neighbor is revealing the true nature of your heart." The lost neighbor, relieved to be at home again among supportive friends, thanked one and all for his new lease on life. The last I heard he was working hard and making progress thanks to his new shot at a good life. Sunday morning as I walked across a parking lot to my car after church, a gentleman approached me. He asked if I could help him with a little money to help address his hunger. I have no hard and fast, set rule on whether or not to grant such requests. I almost always employ the time-tested "follow my gut" strategy. On this day my gut was telling me I needed to talk to the man, but not take part in his collection offering. So, I began that conversation, or I almost began it. Before I could really engage the man, two police officers rushed across the lot on bikes to intervene on the man and our conversation that almost happened. One officer pulled me aside to ask if the man had requested money. When I replied that he had, the policeman asked for my name and phone number, both of which he promptly wrote on the palm of his hand! As we talked, I noticed that a patrol car sped up to join the "apprehension." At this point it seemed a bit like overkill in real time to me. I tried to explain what I did on my day job, hoping to talk the policemen down a bit. They were professional and determined. They were not abusive toward the man, but neither was the man to them. The guy is very poor. He may be an alcoholic, though I had no inkling of that from his behavior. Like I say, the guy is very poor with few options, save the charity of church-goers on a Sunday morning after worship. Lesson learned at church last week: it is very clear that poverty is now officially illegal. You can go to jail for being poor, if you seek assistance from your fellows around you. I mean there are laws to protect people like me from guys like him, and from having to face the fact that the Dallas dance just ain't playing out so well for lots of our people. I don't guess you can get locked up around here for telling the truth, can you? 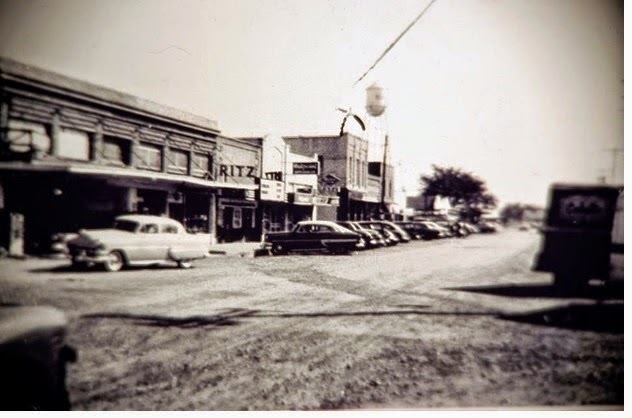 Richardson, Texas, circa 1955--my hometown! I spent many a Saturday afternoon in the old Ritz theater right there on Main Street in "downtown" Richardson, Texas! The center of town back then didn't enjoy the benefit of paved streets. The population wasn't over 2,000, when someone snapped this photo. My dad served as City Secretary at the time. City Hall was a white frame building that co-located with water utilities, police and fire departments. it would not be to such as she. “Prove it!” said the bishop. “Ask God what are my greatest private sins. The woman agreed to do so and they parted. and the bishop greeted her with a smirk. The old woman spoke softly but with assurance. she was almost at a point of Easter. Such a stone is heavy and not easily removed. Easter is sometimes much more than three days coming. she mysteriously brought us a whiff of Easter. Kayla McClurg lived in the community of Providence House in New York for five years. Their work has inspired resurrection for thousands of women. Gloria Campos Luncheon Celebration to benefit CitySquare's TRAC!